Word(s) of the Day: Jesus is my God too! Today we delivered water to 3 different districts in Cite Soleil which means we filled A LOT of buckets and we held A LOT of Haitian babies. In the United States, delivering water means you're a Culligan man, but in Haiti, delivering water means bringing life. Cite Soleil is not known for its hospitable environment, its known for its gang violence and poverty. Very few people have running water or electricity. Many Haitians have never set foot in Cite Soleil and gasp at us when we say we do. To be welcomed into a place where the police won't even go is nothing short of a miracle but things are changing there and of course, God is part of it. They just recently finished building a church on over 80 feet of trash and within the church, there is going to be a school. 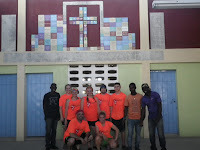 This is the only church in the extremely impoverished area of Cite Soleil. The site is by no accident, its at the corner of 4 rival gang districts. This indicates a change of thinking and a shift in power. The school is offering both adult education and traditional child education classes in hopes to change the mentality that if born in Cite Soleil, you die in Cite Soleil. In the afternoon we went to the Haitian Initiative, a soccer program started by a professional soccer player that requires the players to go to school, maintain good grades and in turn the players are fed and taught basic soccer skills. The discipline shown by the young kids was pretty incredible and their coaches made it a respectful and caring environment for them to grow in both physically and emotionally. Boy: Do you know Jesus in your heart? Me: Yes I do know Jesus in my heart! Boy: Is Jesus your God? Boy: Jesus is my God too! The conversation is simple but the look on his eyes and the hug that he gave me was unforgettable. We might be separated by 1,800 miles but our love for God and Jesus stopped time for just a second. Sometimes you just know when you see someone, even a little someone, that they are going to do amazing things for God's people, this little boy will be a leader for God's kingdom.